It's a custom at the European Triode Festival (ETF) to hold an auction at the end of each festival. 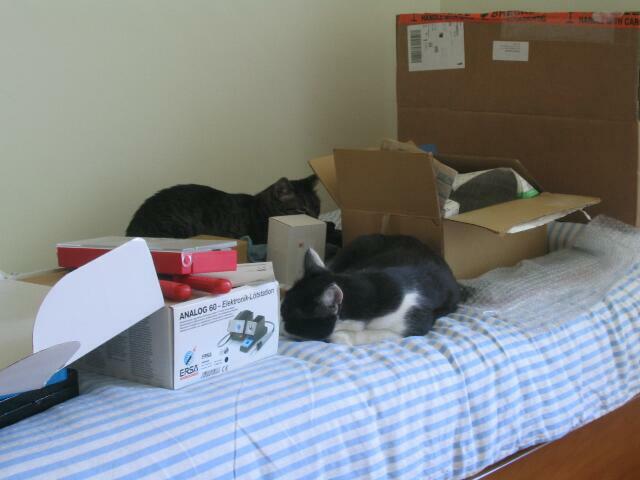 Attendees, who are not only lovers of tube electronics but also designers and manufacturers, provide free goodies (equipment, cables, tubes, capacitors, books about electronics to name a few examples) for this auction. The auction proceeds are used to finance the festival itself. Needless to say, the auction is a lot of fun and one of the highlights of each festival. At ETF 2006, which was held in November in Biezenmortel, The Netherlands, I was the lucky guy who placed the highest bid on the main auction attraction: the complete kit version of the then-brand new and in the meantime highly regarded TentLabs DIY CD player. Believe me, I was a happy man and really excited to be able to build and own Guido Tent's CD player creation. Guido studied analog electronics and graduated in the subject of linearity of (directly heated) triodes at a company called deJongSystems. He later developed his knowledge and experience in the digital audio domain by joining Philips in the product development, where he worked on the first digital DVD recorder (Philips DVDR1000). Guido eventually founded his own company, TentLabs, which mainly focuses on the development and supply of high-performance audio modules (analog and digital) as well as the modification and repair of amplifiers - tubes and transistors. I met Guido the first time at ETF 2004 and then in 2005 at the following ETF gathering. 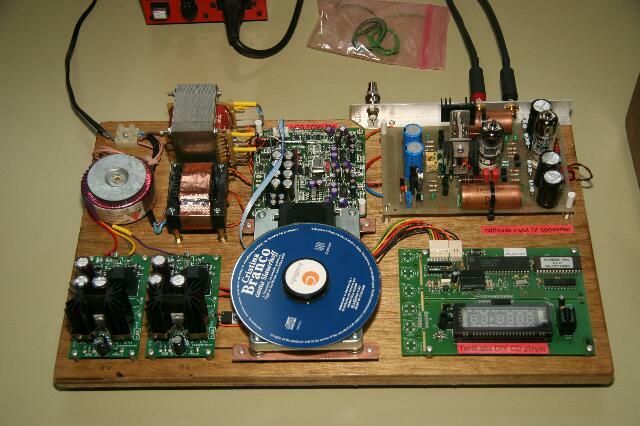 I could experience firsthand a pre-production model of the TentLabs DIY CD player, which impressed me with its natural, non-fatiguing way of reproducing music from CDs (below you can see a photo of this pre-production version). 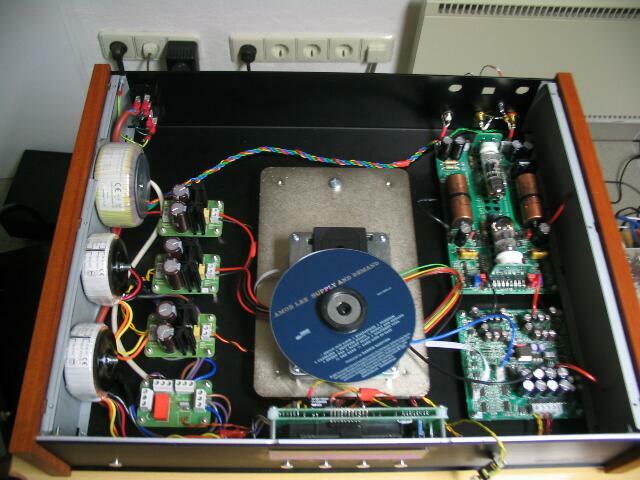 This DIY CD player provides both analog and digital outputs, and according to the TentLabs website: "uses non-oversampling conversion, and has a tube based output stage, extensive power supplies and is housed in an elegant solid cabinet, made of metal, aluminium and wood. The dimensions are 473*370*95 (W*D*H), the weight is about 12 kg." It also is "build up fully modular. 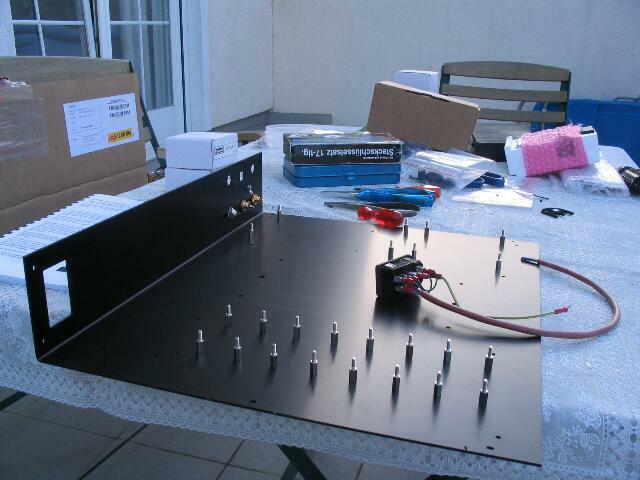 All modules come pre assembled and tested. 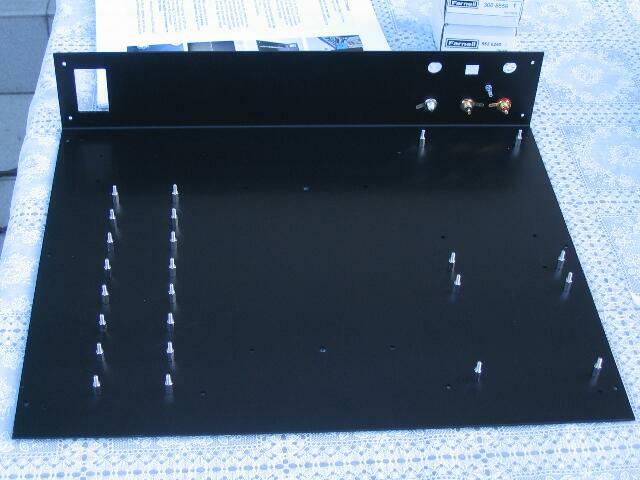 Required wiring is prepared and the cabinet comes as a set of parts. Total assembly does not require high levels of experience in electronics but does ask for some time and secure way of working. Building time is estimated between 6 and 12 hours, depending on the builders experience." My TentLabs CD-player kit arrived in early 2007 and here is my report on building and using this player. I wouldn't say that I'm a highly-experienced builder, more one with medium skills, but I couldn't finish in Guido's estimated 6 to 12 hours (due to some minor shortcomings with my sample of the kit, see report below). However, the manual is excellent and describes mainly every step in detail with great accompanying photos of each step. Give yourself about double the time to finish the player; it's definitely worth it. 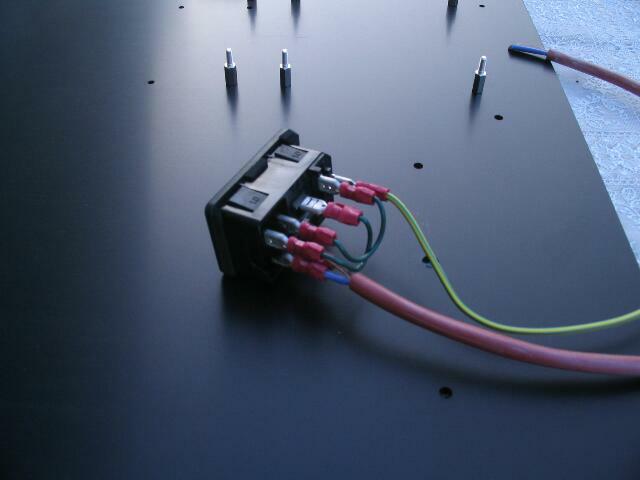 Base plate with pre-assembled IEC mains entry (snap-in version) before mounting. 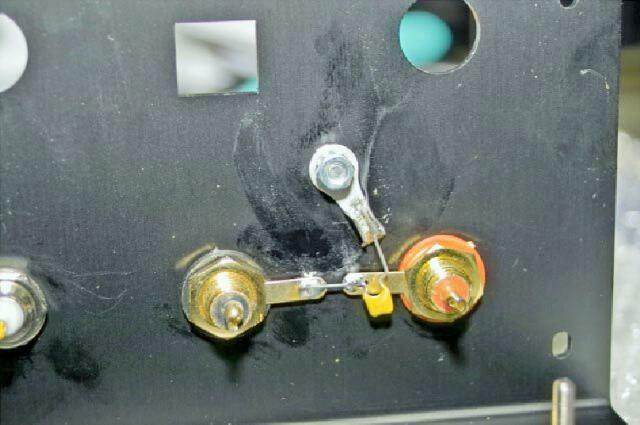 RCA analog output connectors with chassis grounding. Analog output cables (not seen) as well as the connection of DAC board and IV converter were copper in my early 2007 kit version. In the meantime, TentLabs provides solid core silver wire for these connections to improve sonics further. Pre-assembled IEC mains entry (snap-in version) including power on/off switch. Afterinstallation into the chassis, it bounced due to about 2mm clearance between the metalthickness of the chassis wall and the mains entry.To prevent this bouncing feel when turning the power on/off, I glued small stripes of black foamed rubber (about 2.5mm thick) around the inner side rim of the main entry. Worked perfect! regulator boards (left side; only the main pcb in the front has to be assembled) as well as DAC board (right, front) and tubed IV converter (right, back) mounted. 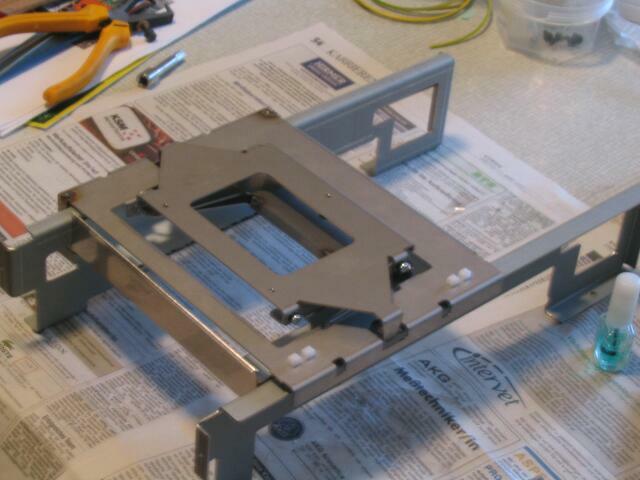 The assembled bridge for the CD drawer mechanism (This is a bit tricky and definitely needs careful attention to the description in the excellent manual!) The nail polish (i.e. the small bottle to the right) is mandatory to fix some of the screws. its wooden side panels and the blue display. And how about its musical qualities, you ask? The four drilled holes for mounting the rubber feet didn't have the needed threads on the base plate delivered, so I had to do the threads on my own (took some time, but worked fine). One of the four suspension studs (these are rubber dampers) broke during the mounting of the quite heavy base plate. This is one of the more challenging operations and needs extra care when done (as is stated in the manual; although I was extra careful, one of the damper's rubber section broke). I couldn't get such a damper here in Vienna, but Guido helped immediately and sent me a spare set of dampers at no charge. Some of the screws and bolts were missing (one of the nicely organized bags with parts was open when I unpacked the TentLabs DIY CD player kit from the shipment box. Possible that some of the tiny screws and bolts got lost during transport. Guido offered to send me the missing parts, but it was easy to get them here in Austria. Besides that, everything was perfect. The quality of parts (AN copper foil coupling caps, AN tantalum resistors in critical areas of the IV converter, separate torodial transformers for each of the three regulator boards, TentLabs master clock on the DAC board, etc) as well of the manual are definitely top and Guido provides his expert help if a customer encounters problems during the assembly process. So how does the TentLabs player perform in musical terms? Well, I like the performance of this player a lot. Guido Tent runs the PCM 1704 DA converters used in non oversampling mode, which due to the absence of a digital filter, leads to the main advantage that less jitter enters the DA converters. Can one hear that? After some months of listening to all kinds of music with this player, I am convinced that Guido's non-oversampling approach (with two times reclocking the signal before entering the DA converters) is a major contributor to this relaxed and analog-like performance. I can listen for hours without listening fatigue, which normally isn't the case when I listen to digital equipment. The bass performance is excellent, detailed with a lot of drive and rhythm (kind of Naim like, I would say) and the mids are full of color. Female and male voices are rendered with natural timbre and life (Gianmaria Testa's 'Come Di Pioggia' or 'Veduta Aerea' from his 2003 CD 'Altre Latitudini' are superb examples; by the way, listen to these songs with your Beloved, these songs will warm hearts...) . The top end is a bit smoother (maybe due to the non-oversampling mode) than I'm used to from other digital sources. In direct comparison with my conventional upsampling CD playback gear in the below EUR 2,000 range (a modified Philips CDR 950 used as transport and the highly-praised Benchmark DAC1 digital analog converter), it seems that the TentLabs has somewhat underexposed treble energy. Fortunately, to my ears there is no lack of resolution in comparison, and I think this is why this player is so listenable (analog like) after all. For systems on the darker side of neutral, the delivered treble energy could possibly be too forgiving, though. I love listening to my Martin K�ng modified Philips CDR 950 connected to my Benchmark DAC 1 (24 Bit 192 Khz upsampling), for the directness of the music, punch, grip, dynamic shading and midrange plus treble clarity. If I want to listen for a longer period of time without any stress and fatigue, however, the TentLabs gets my vote. 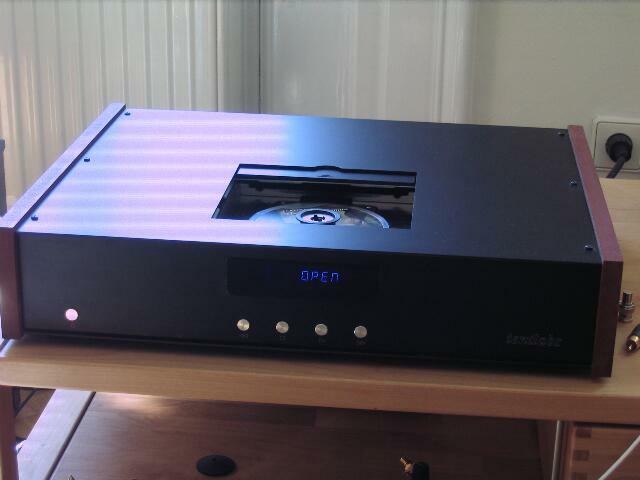 Is the TentLabs a 'giant killer' CD player? I can't answer this question fully now, due to the lack of state-of-the-art CD equipment to compare it with. One of my friends has top-class CD equipment (Audiomeca Mephisto II.x Transport and Orpheus Labaratories DAC; together approx. EUR 9,000) which is the best digital equipment I have had the chance to listen to so far. I hope to be able to arrange for a kind of 'shoot out' in the coming months and will report about the results. The TentLabs is a great machine but this comparison will definitely be a hard task. There is one caveat I'd like to address regarding my TentLabs player: The digital output (SPDIF) is quite picky with regard to the DAC connected. Older generation DACs (such as Audio Alchemy's 'DAC in the Box') lock without a problem, but newer generation DACs (such as my Benchmark DAC1) can't lock. This is unfortunate, because the comparison between the TentLabs tube output stage and a high-class DAC using the TentLabs as transport would be the easiest way to compare the two different digital as well as analog concepts. (The 'DAC in the box' is definitely not in the league of the built in DAC/tube output stage). I would assume Guido has addressed and solved this problem in the meantime and the digital output in the current production version is OK (my player was one of the first to be delivered in early 2007). I'm currently in contact with Guido Tent to figure out a solution for the SPDIF out problem of my TentLabs player and will report a.s.a.p. on my findings of how the TentLabs / Benchmark DAC1 combination compares to the TentLabs itself. Martin K�ng, the Austrian audio-tuning expert recently lent me his heavily-modified Micromega Variodac. 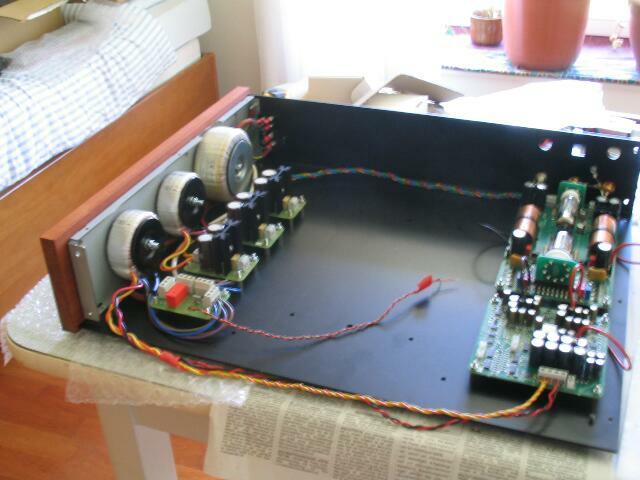 The original Micromega Variodac is a 12-year-old bitstream DAC and no longer in production. The cool thing is that this DAC can be used as a minimalist preamp, too - it provides a voltage amplified line stage with volume control, a pair of analog cinch outs and one pair of analog cinch inputs as well as SPDIF and optical digital inputs. The Variodac comes with a remote too, which allows for setting of the volume levels from the listening spot, a very convenient bonus. Martin's modifications (which primarily were power supply mods, added super clean voltage regulation as well as mods of the voltage volume control) transformed this Micromega preamp/DAC to one of the most listenable and closest to 'a straight wire with gain' preamps I've heard so far. For example, with digital gear connected via analog input or digital SPDIF input, with the latter using the built-in DAC, the musical results were superb and the window to the performances wide open. What shall I say, I was stunned and bought the Micromega Variodac from Martin K�ng the next day. What does this have to do with the TentLabs player you will ask. Well, a lot because the Micromega DAC was able to lock, when connected to the TentLabs SPDIF output. (Every now and then, the connection was lost though, indicating that apparently the signal from my TentLabs is not 100% PCM conform.) But it was worth a try and so I could compare the TentLabs' own tube output stage connected to the Variodac's analog inputs with the TentLabs/Variodac combination connected via SPDIF. Surprisingly, it was a close race... After a lot of different music styles/samples played and listened to, I found the TentLabs as a full CD player a tad better overall, with a bit more color, especially in the mids and slightly better 3D image - tube magic so to say. The modified Variodac on the other hand - although under limited working condition due to the TentLabs' SPDIF problem - had better musical flow as well as treble resolution. The differences were rather minor, though. As soon as the SPDIF lock problems of the TentLabs player are solved, I will keep you informed about the performance of the TentLabs as a drive with both DACs, my new favorite, the Martin K�ng modified Micromega Variodac, and my Benchmark DAC1 upsampling DAC. In the meantime, I get lost in music with the Tentlabs CD player as well as with my new Graham Slee Revelation phono stage both connected to the Variodac preamp, the latter working together perfectly with my Welborne Labs Moondogs 2A3 monos and my Haigner three-way monitor speakers. Guido Tent informed me in the meantime that this SPDIF "locking"-problem is known and TentLabs provides a solution in the form of a modul which can be retrofitted in the player. He will send me this modul and I will keep you informed on how it works! Finally, after some months waiting time the promised TentLabs module arrived. It's a tiny pcb with a TentLabs 16.9344 MHz clock fitted to it for reclocking the SPDIF out signal at 16.9344 Mhz (instead of 8.4672 Mhz originally). Guido Tent provides a well written two page instruction for doing the change (with photos). The trickiest part was removing a tiny SMD resistor, but following Guido's instructions closely, it worked better than expected. After removing the original clock the whole module can be fitted to the 8 pin frame, where the original clock was fitted to. Last step is to solder the cable from the new module to the upper pad, where the SMD resistor was located and that's it. Next step was testing my DAC-board modifications. I put a CD into the top load drive and connected my Benchmark DAC1 and ... yes, the DAC1 connected immediately. The connection to my Variodac was also absolutely stable now. So, SPDIF "locking"-problem solved. Thank you Guido, job well done! This was the time for some careful listening tests after all. At this stage its maybe worth to mention that my system has changed a bit in the last months. 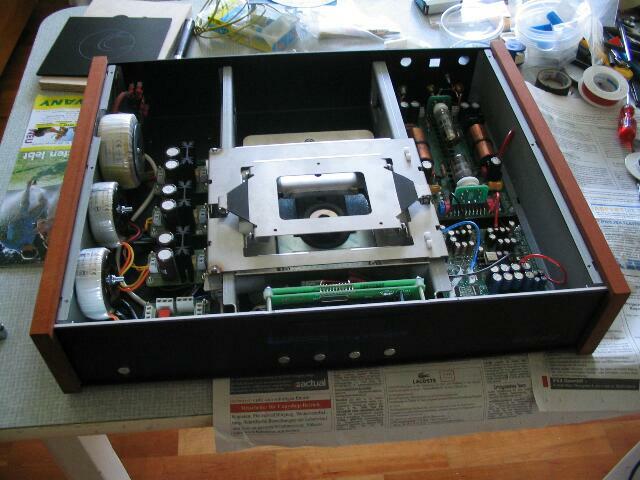 I had the chance to audition a highly regarded tube preamp with built in phono stage, the EAR 868 during the summer. This preamp, especially the superb built in phono stage, did such a good job in conveying the message of recorded music that I couldn't resist and bought it right away. The soundstage is now bigger (have I mentioned that I'm a fan of tube amps and preamps?) and the music reproduction comes closer to the real thing, ie has more air, more life, more drama than all preamps used before.